Never mix bleach and ammonia; this combination creates a toxic and lethal gas! Know your stone: When it comes to choosing cleaning products, natural stone can simply be classified into two general categories according to its composition: siliceous stone or calcareous stone. Knowing the difference is critical when selecting cleaning products. Calcareous stone such as marble is very sensitive to acidic products. It is important to have cleaning products with a pH balance friendly to your stone category. To find out more about your stone, refer to the description of your stone type found in the menu bar above. Counter-top Surfaces: Clean stone surfaces with a few drops of neutral cleaner, stone soap (available at hardware stores or from your stone dealer), or a mild liquid dishwashing detergent and warm water. Use a clean soft cloth for best results. Too much cleaner or soap may leave a film and cause streaks. Never use products that contain lemon, vinegar, or other acids on marble or limestone. Rinse the surface thoroughly after washing with the soap solution and dry with a soft cloth. Do not use scouring powders or creams; these products contain abrasives that may scratch the surface. Floor Surfaces: Normally, it will take a person about eight steps on a floor surface to remove sand or dirt from the bottom of their shoes. 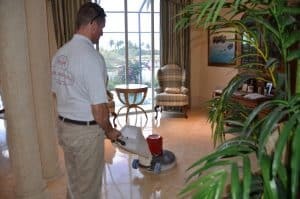 Dust mop interior floors frequently using a clean, non- treated dry dust mop. 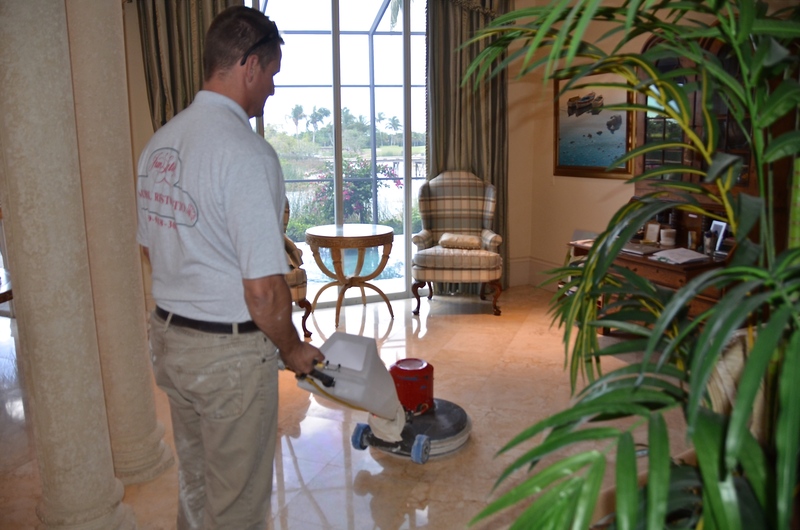 Sand, dirt, and grit do the most damage to natural stone surfaces due to their abrasiveness. Mats or area rugs inside and outside an entrance will help to minimize the sand, dirt, and grit that will scratch the stone floor. Be sure that the underside of the mat or rug is a non-slip surface. Normal maintenance involves periodic washing with clean, potable water and neutral (pH 7) cleaners. Soap-less cleaners are preferred because they minimize streaks and film. Mild, phosphate-free, biodegradable liquid dishwashing soaps or powders or stone soaps are acceptable if rinsing is thorough. Wet the stone surface with clean water. Using the cleaning solution (following manufacturer’s directions), wash in small, overlapping sweeps. Work from the bottom up if it is a vertical surface. Rinse thoroughly with a clean, potable water to remove all traces of soap or cleaner solution. Change the water in the rinse pail frequently. Dry with soft cloth and allow to thoroughly air dry. Bathrooms and other wet Areas: Soap scum can be minimalized by using liquid soaps and also using a squeegee after each use. To remove soap scum, use a non-acidic soap scum remover or a solution of ammonia and water (aprox. ½ cup ammonia to a gallon of water). Frequent or over-use of ammonia solution may eventually dull the surface of the stone. Outdoor Pool and Patio Areas In outdoor pool, patio, or hot tub areas, flush with clear water and use a mild bleach solution to remove algae or moss. Exterior Stone Maintenance: Easily accessible stone surfaces such as steps, walkways, fountains, etc., should be kept free of debris and soiling by periodically sweeping and washing with water. Large installations should be given periodic overall cleaning as necessary to remove accumulated pollutants.